A technical engineer by profession and a dance enthusiast by passion, I was born and brought up in the capital city of New Delhi, India. A typical Indian kid, who’d love to shake a leg and move the moment his parents would ask him to show his talent infront of friends and folks. A self-proclaimed bollywood buff, who’d announce the movie as a hit, if it had awesome songs and stupendous dance moves, I’d copy and dance to any and every bollywood song. I have always been a shy kid, who’d love to watch people dance but never had the guts to face the audience, or even the team i’d join. Yet had a thought that i’d get to dance someday. Dancing has always been something that brings a huge smile to my face, whatever mood i am in. After coming to the States, I finally had the courage to do a stage performance for the first time during my grad school. I took some social dance lessons in Los Angeles, before moving to bay for work. After performing for two consecutive years at an annual function at USC, I decided to finally get better at it and undergo some more training. Being a punjabi, I had to learn professional bhangra, and so I did, from a famous bhangra school in south bay. 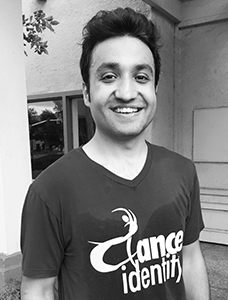 Done with bhangra and bollywood, I wanted to try other dance forms, and that’s how I was introduced to Dance Identity in 2013. It is true, that Shaira says, people come to DI just to have fun, but when they actually start dancing, they know how much technique, strength and training a dancer requires. And it’s an everlasting learning process. I’ve been training in Contemporary, Hip Hop, Salsa and Jazz, with DI since the time I joined it in 2013. I started with DI team to perform at a flash mob and have performed with DI at some more events not limiting to Stanford Holi, TieCon Meet, Holiday Bazaar and Chinese New year celebration. Be it any corporate event or a school’s fundraising event, performing with the DI team has always been enriching and a new learning experience. I’ve also performed at a few charity and voluntary events at my workplace. I also assist DI with some Bollywood Bhangra cardio classes.